The Art of Exile: Painting by Tibetan children in India is a wonderful book that enables one to understand the sad situation of Tibet through the eyes of the Tibetan school children Many of these children suffer from the separation and loss of their families in Chinese –occupies Tibet. 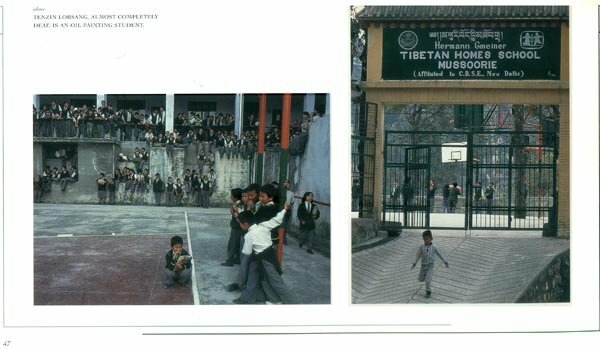 The Book brings to life their childhood memories, the Tibetan spirit and culture, and the future aspiration of these unfortunate children who now in exile have the opportunity for education like their counterparts in the free world. I am confident that the efforts they have made in creating this book of paintings will go a long way in making the world at large, and especially the children, more aware about the plight of Tibet and the contribution that the unique Tibetan way of life can make for humanity. Sarah K. Lukas founded Friends of Tibetan Women's Association in 1990, an affiliate of Tibetan Women's Association in Dharamsala, to further TWA's efforts to improve the lives of Tibetans living in exile in India. As president of FOTWA, she has worked to establish sponsorship programs for Tibetan children, as well as for Tibetan elders and the infirm living throughout India. FOTWA supports Tibetan self-sufficiency through funding of day care and other programs. 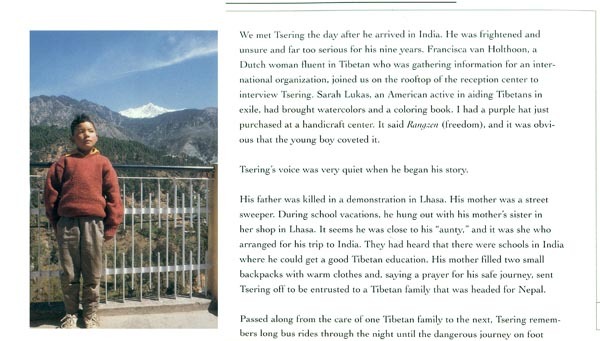 Lukas founded the painting club at Tibetan Homes Foundation, in Mussoorie, India, in hopes that through the language of art, Tibetan children will be able to express their feelings, to become more aware of their heritage, and to tell the story of Tibet. Kitty Leaken's interest in Tibet began in 1992 when, as a staff photographer for the Santa Fe New Mexican, she met several Tibetans through the resettlement program in Santa Fe. Subsequent travels in India and Tibet introduced her to Sarah K. Lukas and Friends of Tibetan Women's Association. Under the auspices of FOTWA, Lukas and Leaken have made several extended trips to Tibetan settlements in India. 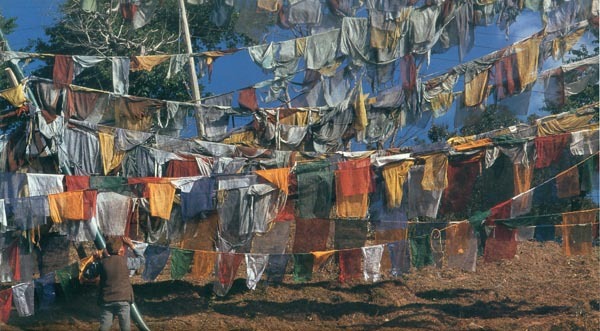 Leaken's documentary photographs of Tibetan culture in exile are incorporated into the exhibit "At Home Away from Home: Tibetan Culture in Exile," sponsored by the Museum of International Folk Art in Santa Fe. Clare Harris, Ph.D., is a lecturer in the anthropology of art at the University of East Anglia, Norwich, United Kingdom, where she teaches courses on the visual culture of India, the Himalayas, and Tibet. Since her first visit to India at the age of eighteen, when she worked at the Tibetan Homes Foundation school in Mussoorie, she has made frequent fieldwork trips to India, Nepal, and Tibet over the last thirteen years. Her doctoral thesis, "Depicted Identities: Images and Image-makers of Post- I 959 Tibet," is due to be published in 1998. By Frank J. Korom, Curator of Asian and Middle Eastern Collections , Museum of International Folk Art SINCE 1959, THE YEAR THAT HIS HOLINESS THE FOURTEENTH DALAI LAMA escaped to India, it has been estimated that at least 131,000 Tibetans' have fled their homeland to seek shelter in other parts of the world. This unprecedented mass migration out of Tibet is due to ongoing conflict between Tibet and the People's Republic of China (PRC) over questions of political autonomy and cultural self-determination. While not denying that Tibet has interacted historically with the PRC in cultural and economic terms over a period of many centuries, the government-in-exile still maintains that the Tibetan Autonomous Region, as the country is now officially called, was indeed a sovereign nation before the Chinese occupation. Opinions about this controversy are heated on both sides, making dialogue difficult. As a result, an official resolution still seems a mere distant hope despite the constant media attention the dispute attracts. Whatever position one takes on the "Tibet issue," the reality of the situation remains: Many Tibetans, be they in India, Nepal, Europe, or North America, now live in a perpetual atmosphere of displacement. One of the great tragedies arising out of the above scenario is the impact that exile has had on children. Many who were born in Tibet, and whose voices are heard in this book, tell of harrowing experiences crossing the Himalayas on foot, on horse- back, or by truck to seek refuge in South Asia, perhaps never to see their families and friends again. Other Tibetan children who were born in India or Nepal grow up learning about their cultural traditions through the stories and guidance of adult refugees or in the classroom. To them, Tibet is a real, albeit imagined, place that must be conjured up and preserved in any way possible. 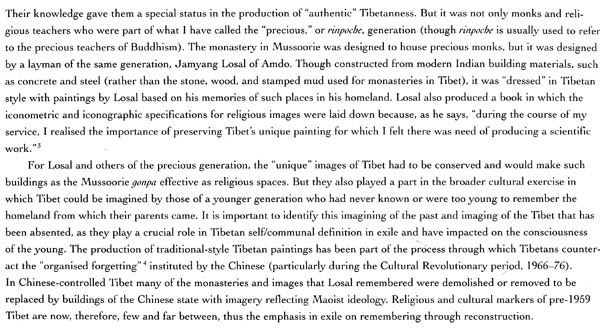 The issue of preservation, we should note, is a theme pervading discussions about Tibetan diasporic culture. Many people, both Tibetans and their foreign sympathizers, fear that traditional Tibetan culture, with its distinct spiritual heritage, is rapidly disappearing. While this may be true to a significant extent, it is also important to acknowledge that Tibetans have evidenced a remarkable resilience, thereby allowing them to develop further their language, religion, and culture even while adapting to their new environments over a period of more than thirty-five years in exile. 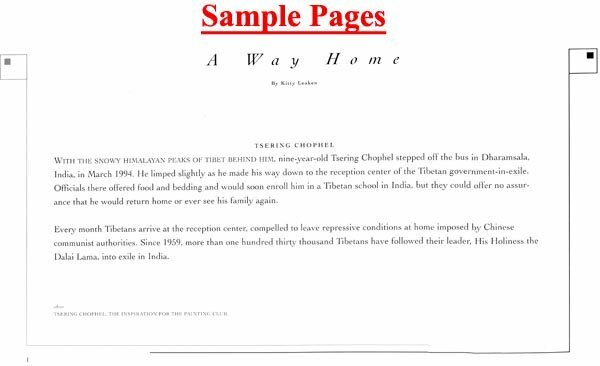 The Tibetans' ongoing success in perpet- uating their own culture in exile thus far stems from the fact that they were able partially to reconstruct their ways of life with financial assistance from a number of foreign sources, as well as through collaboration with various agencies in their host countries. The perpetuation of Tibetan traditions abroad will depend on the degree to which elders will be able to continue to transmit their personal knowledge to future generations of Tibetans born in exile. The resolve of children as bearers of culture will thus determine whether or not the image of Tibet will remain vivid well into the next century Needless to say, their education and care are primary concerns. 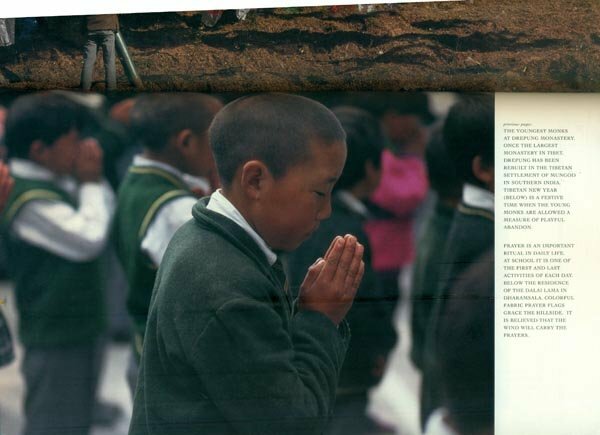 Schools have served the purpose of educating the many Tibetan children who have been separated from their families as a result of their flight or who are learning about Tibet for the first time in an alien milieu. 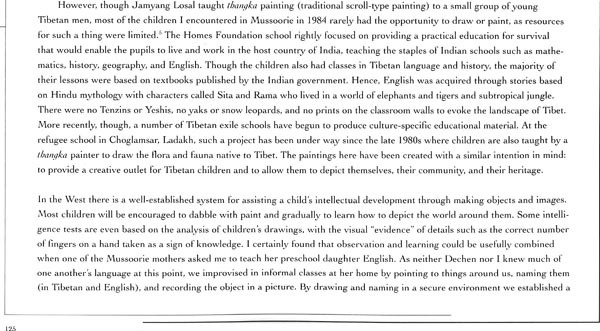 Educational institutions, be they monastic or secular, have been a great factor in the revitalization of Tibetan culture in exile, and it is from one such school, the Tibetan Homes Foundation (THF) in Mussoorie, a mountainous hill station in north India, that the paintings reproduced in this book originate. Established in 1962, the school provides for the physical and intellectual needs of disadvantaged Tibetan children in South Asia. Today, more than 1,700 children are cared for by THF. 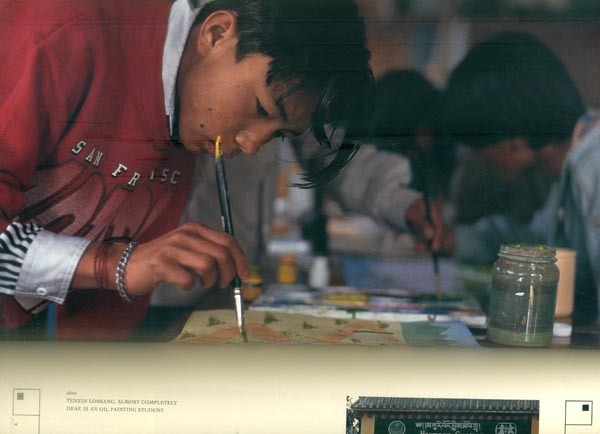 Some have gone on to work for the Tibetan government-in-exile, while others have entered professions utilizing artistic skills such as painting. 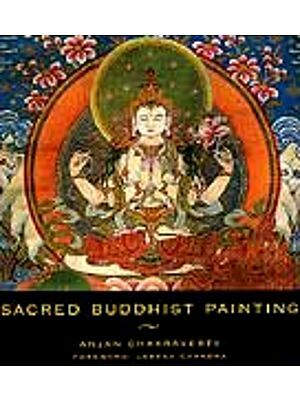 Thangka painting is one of the best-known forms of Tibetan Buddhist art, and some children enroll in thangka painting classes as an integral part of the curriculum. However, lesser known is the fact that students are now also learning to express themselves in a different, secular style when they participate in the painting club discussed by Kitty Leaken in the text that follows. Such paintings allow these children to express their feelings of displacement visually by transferring their lived experiences onto canvases. This is, for many, a form of therapy to help cope with their sense of confusion and loss. A social psychologist who conducts research on adolescent art has recently written that "To produce art is not only to illustrate life, experiences and thoughts; by organizing and concretizing experiences and thus making them more comprehensible to oneself, art is also a means to construct identity. Making art, and the sensitive processing of everyday life that it enables, can help an artist to gain a sense of reflexive control over her life circumstances.Y' Indeed, the paintings included herein evince a distinct sense of the trauma of cultural rupture, of physical displacement, and display a strong sense of Tibetanness by drawing on the profound experiences of leaving home to adjust to life in India. Moreover, many also allow the painters alternatively to remember or imagine home. In the interpretive essay that follows the paintings, art historian Clare Harris, who herself taught at THF in the 1980s, provides us with some ways to understand the stories these paintings tell. When the Museum of International Folk Art embarked on the planning of an exhibition on Tibetan culture in exile, I went to Dharamsala to explore the possibilities. On my second trip there in 1996, I met Sarah Lukas, president of the Friends of Tibetan Women's Association (FOTWA). She shared her collection of children's paintings with me. As I examined the paintings, I was struck with their power to convey feelings difficult to describe in words. It was then that I decided to present some of the paintings at the museum for inclusion in our exhibition. Photographer Kitty Leaken, whose own impressions follow, had already been working closely with Lukas to document the children of THF. When we all met during the summer of 1996 in Santa Fe, we collectively deemed it wise to supplement the paintings with oral narratives to be provided by the painters themselves. 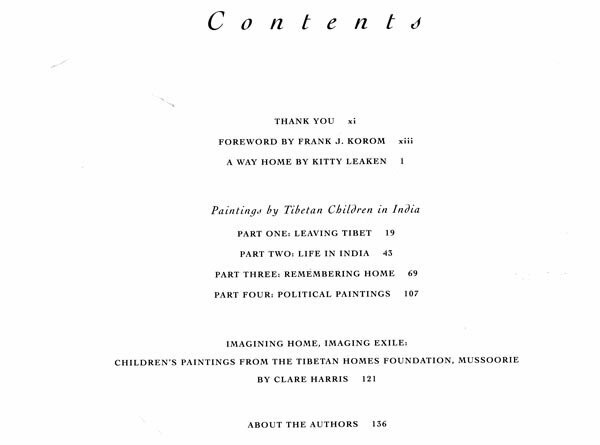 Kitty Leaken, Sarah Lukas, and Thinley Gyaltsen have dedicated a commendable amount of energy to documenting the children's artistic progress and to recording and transcribing their stories, which figure prominently in the captions for the paintings. Taken together, the paintings and narratives suggest the strength and creativity of these children Who have lost so much but Who now stand to gain. At the same time, their art and stories also should remind us of the harsh sociological realities of refugee life. This book reflects much of the thinking that went into the planning of the exhibit "At Home away from Home: Tibetan Culture in Exile" and mirrors the collaborative spirit that goes into any successful museum project. Museum director Charlene Cerny originated the idea for an exhibition on Tibet, and educator Laura Temple Sullivan also played a key role. Many agencies financially supported the development and implementation of the exhibition that inspired this publication, specifically the National Endowrnent for the Humanities, a federal agency; the International Folk Art Foundation; the Museum of New Mexico Foundation; the Fund for Folk Culture's Conferences and Gatherings Program, underwritten by the Pew Charitable Trusts; the McCune Foundation; the City of Santa Fe Children and Youth Fund; and the Friends of Folk Art.